Chelsea grabbed a fortunate win over Slavia Prague in the Europa League quarter-final first leg thanks to Marcos Alonso’s late header. Here’s how we rated each Blues player in the 1-0 victory. Guilty of some wayward distribution and some indecisive work when dealing with crosses, but Kepa made an excellent save to turn away Ibrahim Traore’s rasping strike in the second half. Azpilicueta was below par in attacking areas throughout but dependable enough at the back. The German covered well and also made several crucial challenges in a solid showing at the centre of the defence and almost scored with a well-struck effort after the interval. He was caught napping on a couple of occasions which could easily have led to goals. The Dane continues to demonstrate his ability to read the game and quality on the ball. However, his concentration levels remain suspect. Showed plenty of effort in a poor performance characterised by countless misplaced places, over-hit crosses and some casual defending. He carried on trying to get forward and was rewarded for his persistence with a fine headed winner. Steady in the holding role, providing a good defensive screen for the most part, albeit he struggled to find space and set up attacks in the face of Slavia’s intense pressing game. Lightweight and ineffective in a midfield that was bullied and disrupted by a brighter and sharper opposition. Showed good intent and never stopped trying to get forward but was unable to influence the game much. Pedro was deprived decent time on the ball and made little use of it when he did find himself with a chance. 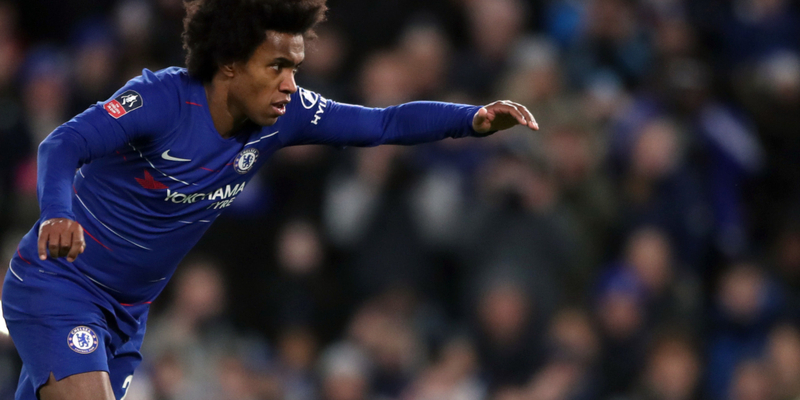 A typical Willian performance. He was too often careless in possession, sloppy with his passing and at times lacked awareness in his defensive duties. But he always looked dangerous when running with ball at his feet and was unlucky not to score with a fine first-half strike that hit the bar and a low shot across goal after the interval. And he teed up the late winner with a wonderful cross for Alonso. The Frenchman won more than his fair share of aerial duels and showed good desire and work-rate. Giroud chased many a lost cause and made numerous intelligent runs but became increasingly frustrated as the game wore on as he forlornly waited for an opportunity to add to his nine Europa League goals this season. Brought on with just over 30 minutes remaining to try to lift a lifeless display and made an instant difference, demanding possession, creating chances with his dribbling ability and freeing up space for his team-mates. Another big gun summoned to up the standards and played his part in a more respectable final quarter of the match. The England midfielder brought much-needed tempo and a drive and determination from central areas.